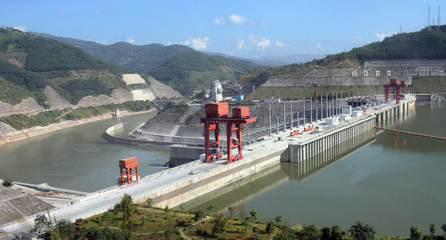 The Jinghong dam can contain up to 600 million cubic meters of water and a capacity of 1,750 megawatts. Experts in Laos, Thailand and Cambodia carefully monitor the level of the river. High risk of flooding. But the government of Phnom Penh, a staunch ally of Beijing, denies the threat. Vientiane (AsiaNews) - Nations along the lower Mekong are on maximum alert due to the release of large quantities of water from a dam in the southern Chinese province of Yunnan, which is likely to cause serious consequences in Laos, Cambodia and Thailand. Experts from the three countries are closely monitoring the level of the river, South-east Asia's main water artery, after having received a notice from the Beijing authorities. From September 5 to 30 the Jinghong dam, a plant of 1,750 megawatts, will release "a large volume of water" downstream, due to heavy rains upstream of the plant. There is a real risk of heavy flooding, which threaten to cripple the life and economy of entire populations. An official from the Lao Ministry of Environment and Natural Resources, interviewed by Radio Free Asia (RFA), confirms the note from Beijing and adds that in Houayxay, the capital of the province of Bokeo, the water level has already risen and "has exceeded six meters". The release of water from the dam could bring the threshold up to 10 meters, although it remains within a minimum safety margin before breaking its banks. At the moment the Jinghong dam on the Mekong River releases a volume of water equal to 535 cubic meters per second; the plant is able to contain between 591 and 602 million cubic meters. The maximum release capacity, in the case of imminent danger, is of 9 thousand cubic meters per second; in this case, in a few days the river level could rise by three feet in the Thai province of Chiang Rai. Experts from the American NGO International Rivers believe the consequences from such a sudden and large release of water could be disastrous. "In the Mekong River Basin - warns Ame Trandem, program director for South-East Asia - water releases from dams compounded with heavy rainfalls, can make for disastrous consequences". The activist added that the construction company, the Hydrolancang, and the Chinese government "should be responsible for compensating all people in the basin who are impacted by any flooding caused by the Jinghong Dam". In Cambodia, government authorities - among the nations of South-East Asia is Phnom Penh has strongest ties with Beijing - are downplaying the risks and argue that there is "no evidence" of an increased inflow of water from China. However, the sources of the 3S Rivers Protection Network argue that both the level of the Mekong in Cambodia, as water quality and fish populations will be affected, "proportional" to the amount of water released. The Mekong River starts in the Tibetan plateau, flows through China's Yunnan province until it reaches Myanmar, Thailand, Laos, Cambodia and Vietnam. About 65 million people live along the river, relying on fish farms and the natural fishery, which is worth an estimated US$ 3 billion. Considered the second most important river in the world in terms of biodiversity, the 4,880-km long Mekong is threatened by a number of projects involving dams and hydroelectric power plants. Vietnam, Cambodia and the Mekong River Commission (MRC) have called for a ten-year moratorium but have not had any success. Meanwhile, there has been a 300,000 tonnes drop in fish catch.